A few weeks ago, I shared some suggestions of books for elementary aged students to read this summer. 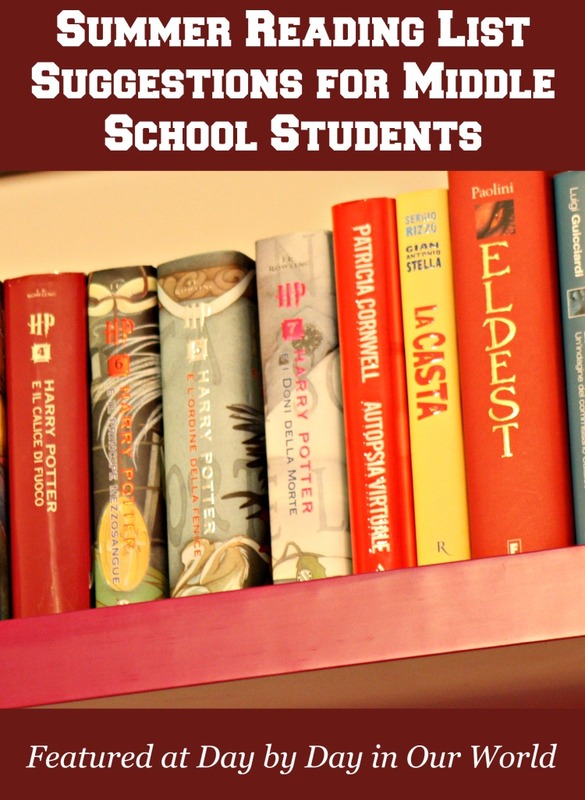 Today I am back with summer reading list ideas for the middle school years. While that might be considered grades 6 to 8 for most, I find that there is some overlap of books into older elementary students as well as into high school. Note ~ Links to Amazon are affiliate links and may net our family a small commission should you elect to purchase through the link. Thanks in advance if you do so. If there is a category of books that really appeal to my boys during this age range, it would be this one. Reading of lands where the fantastical happens just appeals to them. Add some physical conflicts, whether fighting a dragon or other enemy, and they are sure to have some interest. Artemis Fowl is a series which is fantasy with comedy thrown in. We began this series as an audiobook on a long car trip. My husband, who is not as big of a fiction reader as the boys and I, couldn’t stop snorting during certain scenes involving a certain dwarf. Eldest is the beginning of the Inheritance Cycle. Beyond being entertaining, I always loved sharing with the boys how the author began writing Eldest while he was a homeschooled teen. Fablehaven has a brother and sister who discover their grandfather is the caretaker of the realm known as Fablehaven. Here you will find greedy trolls, mischievous satyrs, plotting witches, spiteful imps, and jealous fairies who live in relative order until ancient rules are broken. Harry Potter is a series which can be a bit controversial for some with the prominent use of magic. However, it is one that has helped so many kids get hooked on reading that I can’t help but mention it. We did most of the titles as audiobooks in the car so the younger boys could listen along. I do like the overall story arc with themes of redemption present. Percy Jackson & the Olympians , The King Chronicles and Heroes of Olympus are all series from author Rick Riordan. My rising 7th grader has read all of them and definitely prefers the books over the movie versions for Percy Jackson. If you have a child who loves Greek mythology, these series will most likely appeal to them. After fantasies, my boys tend to favor historical fiction titles. Many of these favorite books were used in our homeschool history studies, too. Roll of Thunder, Hear My Cry is set during the Depression and tackles the issues of racism and social justice. Sign of the Beaver features a 13 year old boy during the 1700s which shows the relationship between the settlers and natives. Moccasin Trail is the story of a young man who had been separated from family and taken into the Crow Tribe. After being reunited with siblings, he has to learn how to live as part of their family in the wild west. My Side of the Mountain has a young boy escaping city life and running to the mountains. He befriends a falcon (Frightful) and acclimates to life in the wilderness. There are 2 other titles written after this one. Cheaper by the Dozen and Belles on Their Toes share the story of the Gilbreth family at the turn of the 20th century. If nothing else, it is quite entertaining to see how their father implemented strategies to make the family run more efficiently. The original movies stays pretty true to the books and could be a great family treat after reading them. While my boys have all been capable of reading a hefty tome, there are times when the comic book or graphic novel book caught their eye. Heavy on illustrations and lighter on text, these are also great for the kids who don’t want to do a lot of reading. You can find graphic novels for many familiar stories (e.g. A Wrinkle in Time and The Call of the Wild.) Favorites included the Oragami Yoda series and Daniel X Manga series. What are some titles you remember reading with your middle school aged child? What books are YOUR middle school students reading this summer? Looking for more suggestions? Take a look at other posts by Schoolhouse Review Crew members sharing their own middle grades reading list. I really like the historical fiction list - that's so helpful in choosing educational books for young readers. I always liked ridge to Terabithia. That's one of my favorite summer reads. How about Where the Red Fern Grows? I always found that book really entertaining. I could go on and on about middle school books! Two of my suggestions are Hatchet (once the reader is hooked on Gary Paulsen, there are lots of other titles by him!) and When You Reach Me.